Dermatofibrosarcoma protuberans (DFSP) of the breast is a rare skin cancer with only a few cases reported in the literature. It corresponds to approximately 1% of all soft tissue sarcomas and to less than 0.1% of all malignancies with annual incidence of 0.8–4.5 cases per million. DFSP usually affects young and middle-aged adults and it can affect any site, but most commonly the trunk and extremities. This tumor arises from the deep dermis and subcutaneous tissues and is usually locally aggressive, but rarely metastasizes. Surgery including wide local excision with free margins remains the main modality of treatment. We report a case in a 28-year-old Omani woman who presented with a right breast lump to a local secondary hospital. She was offered excision biopsy of the lump and the histology came as DFSP with involved margins. The patient was then referred to the Breast Unit at the Royal Hospital where she was reviewed by multidisciplinary team including breast surgeons, oncologists, radiation oncologists, pathologists, and breast radiologists. Her laboratory and radiological investigations did not show any signs of distal metastasis and breast ultrasound did not reveal any residual breast lesions. We performed a wide re-excision of the previous surgical scar with the underlying breast tissues down to the level of the pectoral fascia followed by treatment with radiotherapy. The final histology report showed the presence of a 4×5mm residual tumor, and all resection margins were tumor-free. At six months follow-up, she had no signs of local recurrence. We publish this case report because of its rarity. Dermatofibrosarcoma protuberans (DFSP) is a rare dermal malignancy affecting the deep dermis and subcutaneous tissues. It was first reported by Darier and Ferrand in 1924.1 This tumor is locally aggressive with high recurrence rates, but rarely metastasizes. DFSP usually affects young and middle-aged adults and it can affect any site, but most commonly the trunk and extremities. Wide local excision remains the standard treatment. Here we describe a case of DFSP of the breast in a young Omani female. A 28-year-old mother of five, with no known past medical problems, presented to Sumail Hospital, a local secondary hospital, with a swelling on her right breast, which appeared two months prior. The swelling had progressively increased in size and caused mild discomfort. Clinical examination showed a firm, well-circumscribed, tender, mobile, brownish, 5×6cm mass in the upper outer quadrant of the right breast. Following excision biopsy, the specimen was sent to the Royal Hospital for histological analysis. Microscopic examination showed a well-demarcated non-encapsulated neoplasm (6.5×6.0×2.5cm) involving the dermis and subcutaneous tissue. It was composed of proliferating fibroblasts arranged in a prominent storiform pattern with mitotic activity (seven mitoses per 10 high-power fields) [Figure 1 and 2]. No epithelial elements or breast tissue were seen within the tumor. The deep margin was involved with the tumor. Figure 1: Hematoxylin-eosin staining of the tumor showed a typical storiform pattern of spindle cells, magnification=100×. Figure 2: Spindle-shaped tumor cells in mitosis were visible, magnification=400×. On immunohistochemistry, the tumor cells were positive for CD34 [Figure 3] and vimentin, and negative for smooth muscle actin (SMA), desmin, S-100 protein, CD31, and pan-cytokeratin. 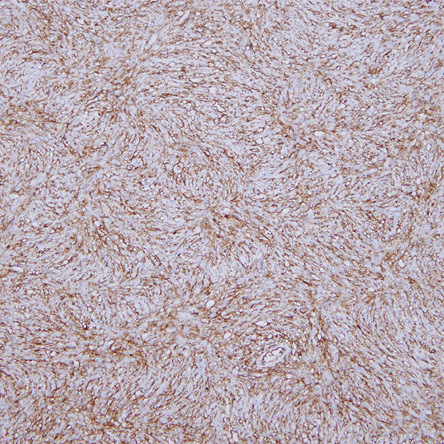 Figure 3: Immunohistochemistry showed positive staining for CD34 in tumor cells, magnification=100×. The final histological diagnosis was DFSP. The patient was then referred to our Breast Unit at the Royal Hospital and the case was reviewed by a multidisciplinary team including surgeons, pathologists, oncologists, and radiation oncologists. Laboratory and radiological investigations did not show any signs of metastasis and breast ultrasound did not reveal any breast lesions apart from post-surgical changes under the previous surgical scar. We performed a wide re-excision of the previous surgical scar with the underlying breast tissues down to the level of the pectoral fascia. 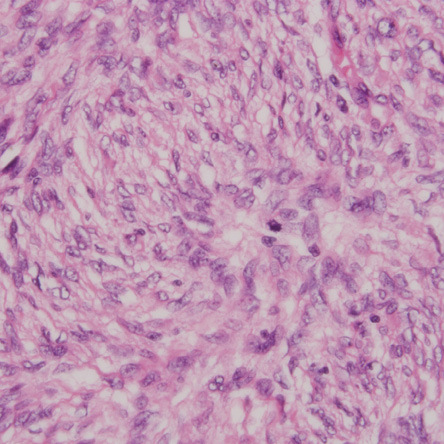 Histological analysis showed the presence of a 4×5mm residual tumor, and all resection margins were tumor-free. The patient was also treated with adjuvant radiotherapy. After six months follow-up, there were no signs of local recurrence. DFSP diagnosis depends on histopathology and immunohistochemistry. Histopathologically, DFSP is characterized by proliferation of plump, spindle cells arranged in monotonous storiform pattern. The cells have little nuclear pleomorphism and low mitoses present.13 The main histologic differential diagnoses for DFSP are metaplastic carcinoma, fibromatosis, myoepithelioma, and Phyllodes tumor.8,9,13 A numbers of immunohistochemical markers are needed to differentiate between these lesions. DFSP has positivity to CD34 in 84–100% of cases and to vimentin, which indicates the fibroblastic nature of the tumor. Immunohistochemical markers for S-100, desmin, and actin are negative in DSFP as was the case in our patient. The standard treatment for localized DFSP tumor is the wide local surgical resection.14 The recommendations for complete local surgical resection include surgical margins of 2–3cm and three-dimensional resection including skin, subcutaneous tissue, and underlying fascia.6,7,15 Higher recurrence rates have been associated with histological subtype, high cellularity, size, location on the head and neck, and high mitotic rate.14,16 Dragoumis et al,6 suggested that the increase of surgical margins tends to decrease the rate of local recurrence. Another study suggested that the surgical margin should not be less than 3.5–5cm for a minimal recurrence rate.17 Other authors suggest the use of Mohs surgery as a first-line therapeutic measure for cosmesis and to reduce the recurrence rate.14,18,19 However, this type of surgery needs training of a specialized team and multiple stages. DuBay et al,14 in their clinical series published had no DFSP recurrences identified after wide excision, Mohs surgery, or combination treatment over an average follow-up of 4.4 years. Adjuvant radiation therapy has been recommended as the sole treatment in advanced cases where surgery is no longer feasible.6,11,14 A cure rate of more than 85% was found in cases where postoperative radiotherapy was used; however, this therapy carries a risk for subsequent development of other skin tumors.11,20 In our patient, we recommended adjuvant radiation therapy as the initial surgery was done in a different center, and also because the initial resection margins were involved. As previously stated, metastasis due to a primary tumor from DFSP is rare (1–4%), and almost all of these cases have been associated with local recurrence and poor prognosis.10 Affected patients with metastatic DFSP die within two years of diagnosis. Long-term follow-up requires strict monitoring every six to 12 months with ultrasound and biopsy in cases of suspected recurrence. We highlighted a rare case of DFSP of the breast. A high index of suspicion should be taken when facing unusual breast lesion and referral to a specialized center is recommended to avoid unnecessary re-operation and to achieve optimal oncological resection. Wide local surgical excision remains the standard treatment for operable cases of DFSP. This tumor has high recurrence rate so long term follow-up with clinical and radiological assessment is recommended for earlier detection of any sign of local recurrence. Darier J, Ferrand M. Dermatofibromes progressifs et recidivants ou fibrosarcoma de la peau. Ann Dermatol Venereol 1924;5:545-562. Bulliard C, Murali R, Chang LY, Brennan ME, French J. Subcutaneous dermatofibrosarcoma protuberans in skin of the breast: may mimic a primary breast lesion. Pathology 2007 Aug;39(4):446-448. Haycox CL, Odland PB, Olbricht SM, Piepkorn M. Immunohistochemical characterization of dermatofibrosarcoma protuberans with practical applications for diagnosis and treatment. J Am Acad Dermatol 1997 Sep;37(3 Pt 1):438-444. Akhtar K, Sherwani RK, Ray PS. Dermatofibrosarcoma Protuberans of Male Breast: An Unusual Presentation. Oman Med J 2012 Jul;27(4). Pérez OG, Righetti R, Woscoff A, Amante H. Case for diagnosis. 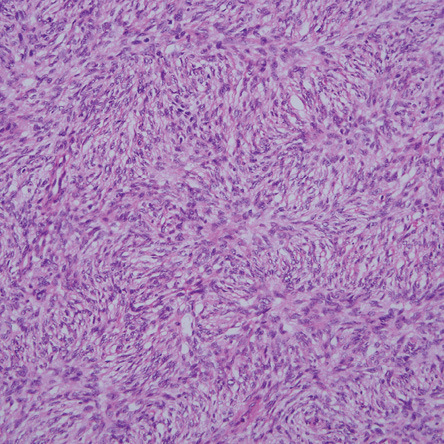 Dermatofibrosarcoma protuberans. An Bras Dermatol 2010 Mar-Apr;85(2):245-247. Dragoumis DM, Katsohi LA, Amplianitis IK, Tsiftsoglou AP. Late local recurrence of dermatofibrosarcoma protuberans in the skin of female breast. World J Surg Oncol 2010;8:48. Chang CK, Jacobs IA, Salti GI. Outcomes of surgery for dermatofibrosarcoma protuberans. Eur J Surg Oncol 2004 Apr;30(3):341-345. Cottier O, Fiche M, Meuwly JY, Delaloye JF. Dermatofibrosarcoma presenting as a nodule in the breast of a 75-year-old woman: a case report. J Med Case Rep 2011;5:503. Lin JY, Sheen-Chen SM, Hsu W, Huang CC, Ko SF, Eng HL. Dermatofibrosarcoma protuberans of the breast. Tumori 2008 Nov-Dec;94(6):861-863. Bhambri S, Desai A, Del Rosso JQ, Mobini N. Dermatofibrosarcoma protuberans: a case report and review of the literature. J Clin Aesthet Dermatol 2008 May;1(1):34-36. Hong YJ, Choi YW, Myung KB, Choi HY. A case of myxoid dermatofibrosarcoma protuberans. Ann Dermatol 2011 Aug;23(3):379-381. Park TH, Seo SW, Kim JK, Chang CH. Reconstructive challenge of dermatofibrosarcoma protuberans in the female breast. World J Surg Oncol 2011;9:1. DuBay D, Cimmino V, Lowe L, Johnson TM, Sondak VK. Low recurrence rate after surgery for dermatofibrosarcoma protuberans: a multidisciplinary approach from a single institution. Cancer 2004 Mar;100(5):1008-1016. Kimmel Z, Ratner D, Kim JY, Wayne JD, Rademaker AW, Alam M. Peripheral excision margins for dermatofibrosarcoma protuberans: a meta-analysis of spatial data. Ann Surg Oncol 2007 Jul;14(7):2113-2120. Goldblum JR, Tuthill RJ. CD34 and factor-XIIIa immunoreactivity in dermatofibrosarcoma protuberans and dermatofibroma. Am J Dermatopathol 1997 Apr;19(2):147-153. Arnaud EJ, Perrault M, Revol M, Servant JM, Banzet P. Surgical treatment of dermatofibrosarcoma protuberans. Plast Reconstr Surg 1997 Sep;100(4):884-895. Rutkowski P, Wozniak A, Switaj T: Advances in molecular characterization and targeted therapy in dermatofibrosarcoma protuberans. Sarcoma 2011;2011:959132. Galimberti G, Montaño AP, Kowalczuk A. Ferrario D, Galimberti R. Outcomes in 11 patients with dermatofibrosarcoma protuberans treated with Mohs micrographic surgery. Int J Dermatol 2012 Jan;51(1):89-93. Mendenhall WM, Zlotecki RA, Scarborough MT. Dermatofibrosarcoma protuberans. Cancer 2004 Dec;101(11):2503-2508.